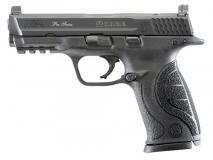 The M&P Pro from Smith & Wesson is based on the based on the popular Pro Series line of competition ready firearms. Reinforced polymer chassis, superior ergonomics, ambidextrous controls, proven safety features. Only the M&P polymer pistol offers this combination of versatility, durability and safety. Featuring a black Melonite finish, stainless barrel and slide, polymer frame, and a capacity of 15+1 rounds. Also features three interchangeable palmswell grip sizes. Optics ready, Pro C.O.R.E (Competition Optics Ready Equipment) models offer a specialized platform for adding accessory optics and are engineered to accept six popular styles of competition-based optics.